Chaudhary Charan Singh Metro Station will be the largest Metro station of the Underground Section, which is also the inception point of this 23 Km long Red Line corridor. This station is constructed at a distance of 500 Meters from the Domestic Airport. To review the progress of this section, Shri. Kumar Keshav, Managing Director, Lucknow Metro Rail Corporation observed the major construction work which are at their final stage. Here, he over viewed all the rooms (electrical, signaling, U.P.S., Ticket Operating Machine(TOM) room etc.) in which electrification work is taking place at its full pace. He not only checked all the emergency gates here but also gave some necessary directions for the 200 Meter wall at the concourse area which is made for advertisement purpose. After this, he stepped down towards platform area where he over viewed the finishing of the tiling work and also the work of track laying of both up and down lines which are completed. 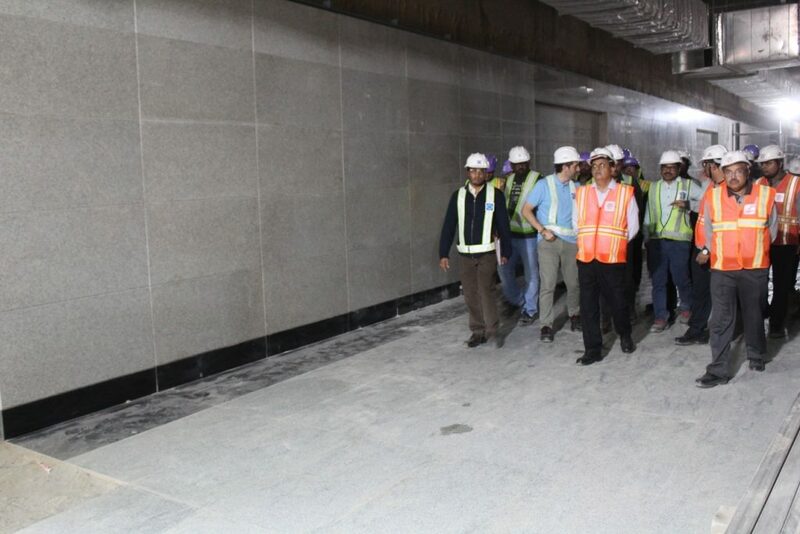 Shri Kumar Keshav inspected each and every corner of this metro station thoroughly and reviewed the work of all the necessary public and staff area. He then visited Amausi Metro Station (the first elevated metro station of this corridor) where the framework of this station is completed and the artwork at the outer structure of it is also been finalized. Here the work of staircase with escalators is completed with it the installation work of A.F.C (Automatic Fare Collection Door) is going on. The civil construction of all the rooms containing necessary equipment is completed while the installation of machines in them is going on simultaneously. Here, the civil work of all the Stairs escalators and lifts towards the platform with tiled platform is complete.